University program leaders in conjunction with accreditation bodies, create Initial Teacher Education programs. 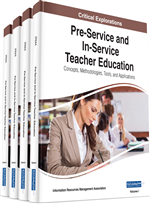 These programs provide the knowledge and practice opportunities that preservice teachers need to learn and develop as teachers, and provide evidence of attaining the requisite standard required for obtaining a teaching position. This places the Initial Teacher Education programs in a unique position to lead much needed systemic change to transform the learning experiences of preservice teachers in schools. However, at the same time, there are challenges involved in creating innovative programs that align with the requirements of stakeholders, which in the first instance involve: accreditation authorities, universities, early childhood agencies and government. This chapter discusses how video feedback might act as a catalyst for change. First it addresses how it provides the conditions necessary to stimulate focused reflective dialogues that align to the graduate standards and lesson objectives, and second the implications for the field. Initial Teacher Education programs and courses are regularly being reviewed and modified to meet the latest requirements of the accrediting bodies in their jurisdiction. This can provide Initial Teacher Education programs providers, e.g. universities with the opportunity to lead change (White, Bloomfield & Le Cornu, 2010), and be innovative as they move through the cyclic redesign and reaccreditation process to meet the most recent policy requirements and guidelines and take account of current research in the field. As with other professions, Initial Teacher Education program providers need to engage students in a course of learning that develops their professional identity through their gradual acquisition of knowledge and skills that ultimately enables them to reach a level of teaching prowess during their final practicum that will meet certification requirements. Currently, in the context of this research the Australian Institute for Teaching and School Leadership (AITSL) and the various state accreditation bodies develop tools to assist in the understanding of the national professional standards. For example, AITSL has developed a website and an App called My Standards App that puts the standards in the pockets of educators to enable them to see illustrations of practice, upload evidence and undertake a self-assessment process. In the state of Queensland, the Queensland College of Teachers (QCT) further promulgates these standards and resources from AITSL (2011), and currently they are developing an e-portfolio creation process for teachers and preservice teachers to facilitate evidence collection and reflection on their practice. These resources are of the highest caliber and are designed to have a positive impact on teacher understanding on a systemic level. At the same time there is movement towards a final Teacher Professional Assessment (TPA) where preservice teachers will need to demonstrate evidence of meeting the professional standards at the graduate level within a standardized format. This may include documents, comments and videos that are moderated by persons removed from the practicum situation. However, this remains in the planning stages in the state of Queensland. At the practice and practicum level programs and courses need to invoke learning experiences that are consistently developed over time and able to make contemporary pedagogical strategies explicit for preservice teachers. Evidence needs to be collected during practicums that directly links to the required standards, and specific learning objectives to which formative and summative assessment can relate. However, in the case of Initial Teacher Education programs, university staff are often restricted because of the requirements of multiple governing bodies and industry/community stakeholders. Thus, in this chapter key implications for program designers and program leaders that emerged from the PALAR study (Chapter 2), case study (Chapter 3) and related issues of ensuring preservice teachers acquire pedagogical knowledge and skills (Chapter 4) are interrogated with a view towards change. There needs to be more effective study of pedagogy at the practicum level making the link between theory and practice and back again from practice to theory explicit. There needs to be an emphasis of more in depth study of how learning is effective through the study of formative learning at the child level as per Chapter 4 and then at the preservice teacher level as per Chapter 3. This has ramifications for ensuring there are linkages across program years, across discipline areas and also between discipline areas. Without this in depth study and awareness there will be slippage and lack of continuity between what is intended by the graduate standards and what actually happens on the practicum plus leaving practicum documentation delivered to supervising teachers a potential enabler or red herring.